There are affiliate links throughout this post. At almost 500 pages, The Ninth Wife is quite a daunting task when you first look at it. It's a pretty cover, and a somewhat hefty book, but it's not terrifyingly scary, just big for the kind of story you think it's going to be. But Amy Stolls tricked me. She used each and every one of those almost 500 pages for her bidding of these incredible characters. Rory and Bess (isn't that from some old movie or novel? Why is this only just hitting me now as I type this? Oh, wait, that's Porgy ... whoops!). Bess is our primary character, and we're thrilled to meet her, to learn about her and to walk through her history and her life with her. But then, wait, what's this? We meet Rory, too? HE talks to us, as well? On his own? Not just through her? This is going to be a more entertaining read than I expected, honestly. Something about the changing viewpoints and perspectives is what keeps me turning that page. And Rory is cute. Not like that kid I knew with the same name in high school cute, but like that guy you watch performing at the bar you used to frequent and wished he'd notice you kind of cute. And here he does. Seriously does. But wow. Rory has been married eight times before. Seriously. Eight times. Count 'em. 1-2-3-4-5-6-7-8 times. That's a mouthful to hear. And a lot to process. Especially when you're sort of seemingly being asked to be #9 at the same time as you're learning about #s 1 through 8.I like Bess. I like her a lot. And I like Rory, too. And I actually begin to accept and feel bad for what he's been through. And I love the transition from him speaking to us to when he begins to tell Bess his story, as well. It's excellent writing. It's a talent I dream of having. Smooth transitions, great storytelling, believable characters. Truly the real deal. Bess and her job, a historian, go off on a search for his-story. And her own. Her family history. And what we learn, the questions we have as she learns, and her quirky friend Cricket and why he must join her on the journey as she helps her grandparents move from one stage of their lives to the next - literally - it's all fantastic and inter-weaving and just worth the read. 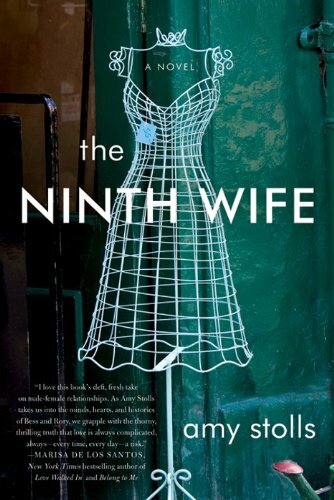 So while you may look at the cover of The Ninth Wife (as shown above) and thinking, this is way more than I can handle in this heat, you're going to surprise yourself, pick it up and turn page after page, devouring Bess, her friends, her family, and Rory, his friends, his family, his history and each and every one of his previous eight wives. Sounds engaging, but I'm not sure I"m quite up to 500 pages. I'll add it to my list though! I just LOVE this review! You did such a wonderful job of convincing me to read this book. Like you I expect a certain kind of book based on the cover, but it sounds like there is a LOT more going on here that what I was expecting. Thanks so much for being on the tour - I'm thrilled this book turned out to exceed your expectations. Hi Andrea -- First just let me say how lame I am that it's taken me this long to thank you for your review of my book when it was truly one of my favorite reviews! I checked out your awesome site when you signed up for the tour and I thought, "please please ... I hope she likes me book." Because seriously ... I love your site, your voice, your humor. I'm a New Yorker in DC (missing good bagels, too), but I have enough southern friends to relate. Consider me one of your newest fans! -- Amy Stolls PS. By lame I mean that I'm pregnant and was due last Sunday and since nothing's happening, I thought I'd finally work through my to-do list. Such is my life.